Following Saturday’s frustrating washout, Sunday in Fowler’s Yard went ahead as scheduled. 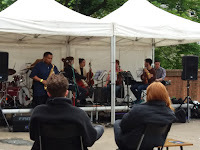 The DJazz free stage programme attracted a crowd despite the rather cool conditions. 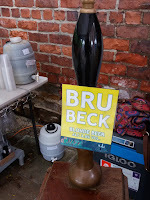 Fowler’s Yard’s Hill Island Brewery was open for business and a pint of Brubeck brewed especially for the festival was the obvious choice (see photo)! Durham University student band WTFunk? opened the afternoon’s entertainment. An enthusiastic outfit, WTFunk? delivered an upbeat set as the audience grew minute by minute. Anyone strolling across Framwellgate Bridge couldn’t fail to hear the jazz emanating from below and doubtless the curious wandered down to see what was going on. On paper, Zach Fox with Strings looked like an interesting project. 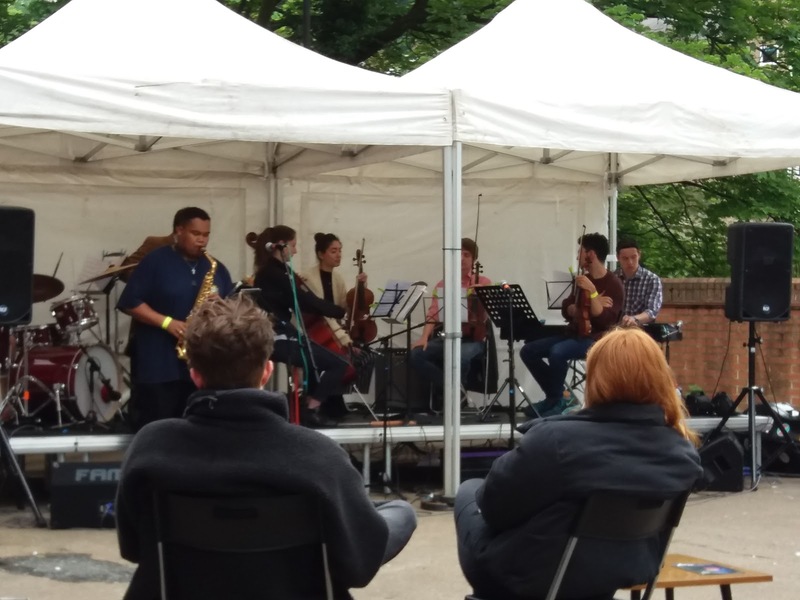 The Durham University student saxophonist had put together a regulation jazz group with the addition of a string quartet. Fox plays alto and tenor and the likelihood was alto sax would be his preferred horn – a la Bird – for this performance. Sure enough, Fox appeared with his alto case. Sound levels outdoors can be difficult at the best of times and the altoist took the time to get the balance right. The set comprised material by contemporary composers – Moonchild’s Cure, Christian Scott’s Perspectives, Ben Williams’ Lost and Found – together with two well-loved tunes, Laura and Kamasi Washington’s arrangement of Clair de Lune. Perhaps it was the cool conditions and the distinct threat of rain but Fox’s set didn’t quite take off. Perhaps an indoor performance of this project could be the answer without any of the many on-street distractions. Debra Milne and Steve Glendinning have been writing material together for some time. Voice and guitar duos are commonplace so perhaps original material is the way to go in an attempt to stand out from the crowd. From Show Me the Man to The Blame Game the Milne and Glendinning songbook formed the bulk of their set, vocalist Milne standing, guitarist Glendinning seated throughout. Milne chose to open their set with a Milne-Bradley Johnston composition titled The Pick Up. Later Milne turned to veteran pianist Alan Glen’s Dawn at Sunset. Perhaps it was the lack of the familiar – ie the GASbook – or perhaps it was the glowering rain clouds over Fowler’s Yard, but again the set didn’t quite hit the heights. In recent times, Niffi Osiyemi has made a big impression at the Jazz Café’s bi-monthly jam session. The Newcastle based medical student arrived at Fowler’s Yard in good time, as did Paul Grainger. Five minutes before Osiyemi was due on stage there was no sign of pianist Alan Law. Hmm. Jazz musicians improvise, don’t they? 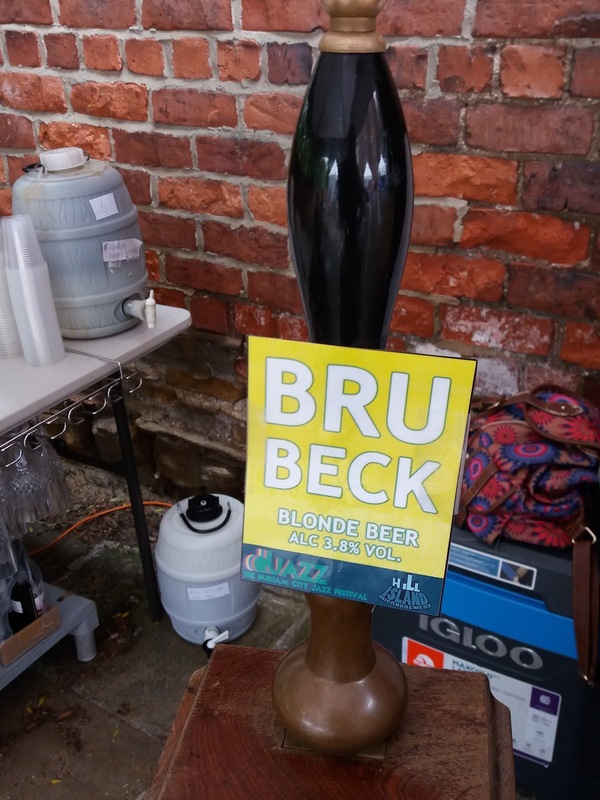 Guitarist Steve Glendinning was still around so he readily agreed to play the set. The reformed Tyneside based trio took to the stage and, as Osiyemi counted in the first number, bassist Paul Grainger’s mobile rang. Guess who? Alan Law, that’s who! He’ll be here in five minutes, said Osiyemi. The trio didn’t hang around preferring to be Makin’ Whoopee. Pianist Alan Law duly arrived – better late than never! – and as he sat down at the piano received a round of applause prompting him to take a bow! Osiyemi’s swing dance friends got to their feet to swing it as the now quartet played Don’t Get Around Much Anymore. Well, things had certainly livened up, the weather was holding off, the bar was still open for business, so Osiyemi decided it was time to Let the Good Times Roll. Glendinning and Law know each other from old so the quartet format was right up their street. As Osiyemi introduced Cry Me a River your correspondent made his excuses and headed for the barbershop…more about that in another review. Fast forward an hour or so, back in Fowler’s Yard, Stu Collingwood’s smokin’ Jimmy Smith organ sound echoed around Back Silver Street. Working with Collingwood on this DJazz date was Russ Morgan, surely the most in-demand drummer on the northeast scene. And there she was, petite, dressed in black, the one and only Mo Scott, singing Rockin’ Chair. If Mo Scott’s on the gig it can’t be anything other than a good one. Fever, Unchain My Heart, God Bless the Child, all very familiar yet, when Scott is the vocalist, let’s hear them one more time. But Beautiful then Mercy, Mercy, Mercy and she was gone.